You are here: Home / Wild Blog / Optics / New Minox BL HD binoculars now available — and you could win a pair! New Minox BL HD binoculars now available — and you could win a pair! The new BL-HD line of high performance binoculars from German manufacturer Minox are now available in Ireland and the UK. 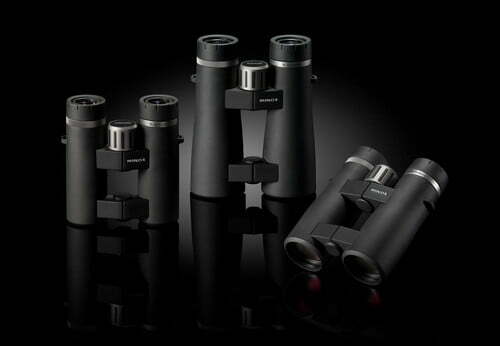 With 8×33, 10×44, 8×44, 10×52 and 8×52 options in the range, there should be a binocular to suit practically everybody. The range has been redesigned to offer cutting edge HD optical performance in a German-made binocular, but at a more affordable mid-range price point than you’d normally associate with a premium European optics manufacturer. That should make it a popular choice with birders and wildlife watchers. We have a brand new pair of 8×44 BL HD for review at IWHQ. With a premium quality feel, and the latest HD lenses and coatings delivering a superb wide-angle view this is a very impressive binocular. We will be publishing a full review of this excellent binocular on the site soon — but the great news is that once we’re finished we won’t be sending this pair back to Minox — we’ll be sending them out to one of you, our lucky Ireland’s Wildlife readers. That’s right, the good folks over at Minox UK have offer the 8×44 BL HD as a competition prize here on Ireland’s Wildlife — which means you could soon be the proud owner of a brand new pair of high quality German made binoculars. We’ll be announcing details of the competition over the next couple of weeks, so to make sure you’re in with a chance of winning this amazing prize — worth €635 — keep yourself up-to-date with Ireland’s Wildlife through one (or more) of the following options…. 1. Subscribe to the Ireland’s Wildlife mailing list using the form below (don’t worry… we hate spam as much as you do and will only send you Ireland’s Wildlife related newsletters and updates). 5. … or (our favourite option 🙂 ) all of the above.